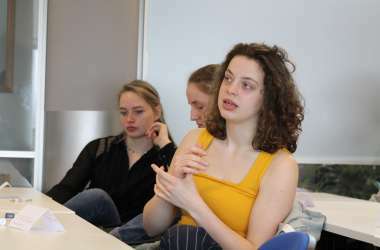 Almost 50 students from the high school KSG Apeldoorn visited Wittenborg University of Applied Sciences on Friday which they thought was the ideal institute to celebrate Cultural Differences Day. KSG has been a bilingual school – teaching in Dutch and English – since 2002. In the Netherlands all bi-lingual schools has to be approved by Nuffic – the Dutch agency promoting internationalisation in the Netherlands – every 5 years. They got to meet Wittenborg CEO, Maggie Feng, and Wittenborg admission officer, Florian Oosterberg, gave a presentation about cultural differences at Wittenborg and shared some of her own experiences in managing those differences. Students also got some inside-information from international students at Wittenborg, Aziamale Kossi Hillaire (Togo) and Nirusika Ratnasingam (Sri Lanka). Aziamale and Nirusika got the opportunity to introduce themselves and share their experience with cultural differences especially during their study at Wittenborg. Afterwards KSG students took turns to share their experiences with international people and or people with a different cultural background than their own. Oosterberg asked students to come up with words which explain their understanding of cultural difference and also what they associate with their own culture. Typical Dutch traditions such as greeting with 3 kisses, Sinterklaas and the Dutch way of speaking directly were highlighted.